U.S. taxpayers living outside the U.S. are increasingly becoming aware of the long arm of the U.S. tax law. First, more and more individuals overseas are understanding the unique U.S. citizenship based taxation system. Unique in the world. 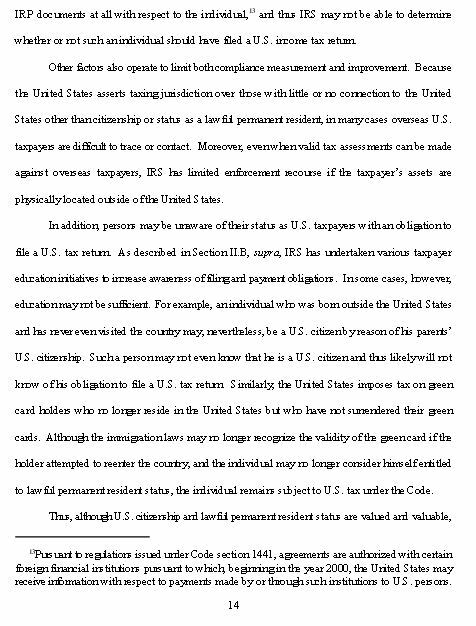 See, Will Congress Intervene to make USC based Tax Laws More User Friendly to USCs and LPRs Residing Outside the U.S.? Second, the Foreign Account Tax Compliance Act (“FATCA”) and its breathtaking reach and scope, is also creating greater awareness of the costs and consequences to U.S. citizens overseas. See, Part 1- Unintended Consequences of FATCA – for USCs and LPRs Living Outside the U.S.
Third, U.S. federal government has become increasingly more aggressive with U.S. taxpayers and their worldwide assets more generally. See, FBAR Penalties for USCs and LPRs Residing Overseas – Can the Taxpayer have no knowledge of the law and still be liable for the willfulness penalty? See government memorandum. Previous posts here have questioned how aggressive will the IRS and the Justice Department be against U.S. citizens residing oversees. See, Will the IRS treat a USC or LPR residing outside the U.S. who purposefully refuses to file U.S. income tax returns and information returns the same as “tax protesters”? A most significant limitation for the government reared its head twice in the last few hours, after two juries came back with acquittals of two separate bankers who were accused of aiding and abetting U.S. taxpayers. They were both employed by non-U.S. banks. Also, on Friday a federal jury in California deliberated and acquitted a former retired banker from the Israeli bank Mizrahi on conspiracy and other related tax crime charges. See Bloomberg, Ex-Mizrahi Octogenarian Banker Acquitted at Tax Trial. In these two cases, the juries obviously did not agree with the government that the bankers were illegally assisting their clients under U.S. law. Part II of this post will discuss the impact these acquittals will likely have as the government attempts to pursue U.S. citizens on tax charges who live overseas.